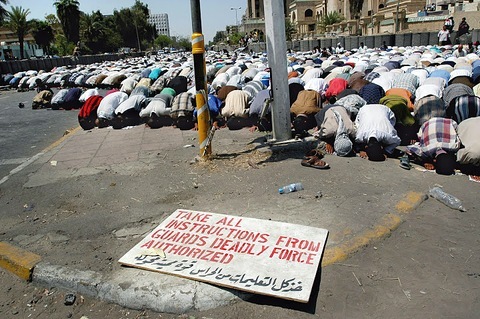 Photographer Thorne Anderson captured this image in Najaf, Iraq, in 2004 while working as a freelancer covering the Iraq War. When photographers go into the field to cover a war, it would seem that making art to hang in museums is probably pretty far down on their to-do list — after staying alive, getting good action photos and selling their work to newspapers and magazines. That’s pretty much what Thorne Anderson and Kael Alford did 10 years ago, when they went to Iraq as freelancers to cover the beginnings of America’s war. They went as journalists, which is what they still call themselves — objective, hardworking photographers who decided not to embed themselves with the American forces who invaded the country, trying to rid it of weapons of mass destruction and of Iraqi leader Saddam Hussein. By not being embedded, Anderson and Alford cut themselves out of a lot of the “action.” But they found other subjects to photograph equally interesting, perhaps more insightful. They covered Iraq itself — and its people — as best they could, living with the war. 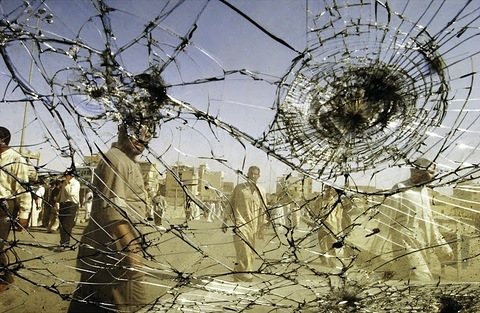 An exhibit of their work, “Eye Level in Iraq”, is on display at San Francisco’s deYoung Museum, on the 10th anniversary of the beginning of that war. Kael Alford shot this Fallujah scene in 2003. 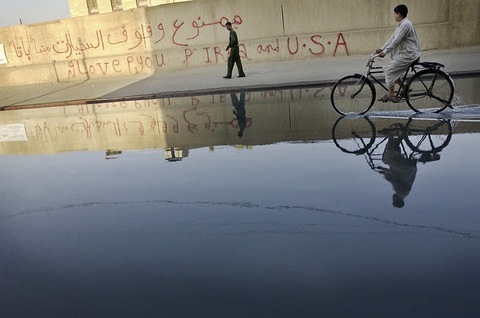 This photo by Kael Alford shows a protest in Baghdad from 2004. Their work is on exhibit at the deYoung Museum until June 16. Watch Spencer Michels’ broadcast report on the exhibit (updated with link). Plus, view the NewsHour’s 2010 reports from Iraq on the end of official U.S. combat operations.